The Jordan Brand pulled off a surprise when they released an anodized edition of the Air Jordan 1 that became an instant hit in the market during its first release. Earlier this month, the Jordan Brand excited its ever-loyal followers again when they released the altitude green colourways of the Air Jordan 1 Anodized. 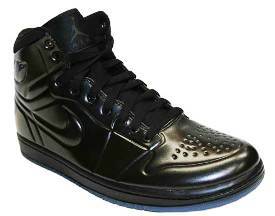 Its release did not end the excitement as they are set to release the “all-black” edition of the shoes. Although an all-black shoe was tagged as being “too plain and simple”, the Air Jordan 1 Anodized is not your typical simple shoes, because it was made for one simple reason: to impress the sneaker world. Like the Altitude Green color of the shoes, the Black/Anthracite version of the shoes is expected to attract buyers once it hit the shelves this month.